Welcome to Online Bearded Dragon Care. We have a resource here for Bearded dragon owners and we hope to give you what you need to know about owning a Bearded dragon. Basic Bearded dragon care is essential for ensuring your Bearded dragon is well looked after so that they live to a good age and are healthy and vibrant. So here at Online Bearded Dragon Care dot com you will find a resource of information and articles about how to look after a Bearded dragon. 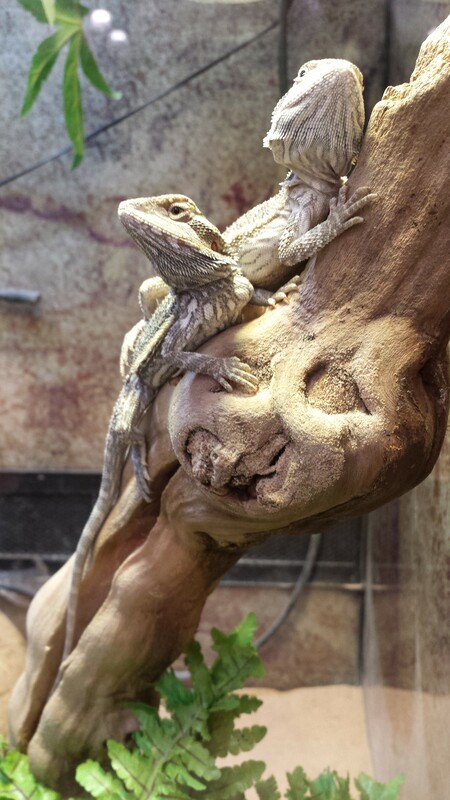 If you are new to looking after Bearded dragon care, then start here. There are all kinds of different posts about all kinds of subjects about Bearded dragon care. In fact our aim is to be the most comprehensive Bearded dragon resource on the web. Here is an introduction to Bearded dragons to help give an understanding of who they are. Bearded dragons are lizards of moderate size who are easy to tame and have a good temperament. They are of moderate size and are sociable, having the ability to interact with each other using a number of different body gestures such as head and tail postures, body tilts, arm circling movements and head bobs. They also have the ability to get along with humans who the have grown accustomed to, this has helped the growth in their popularity as a pet. They are also easy to breed as well. In terms of size, they can grow to up to 60 centimeters in length. Bearded dragons come from Australia, in the eastern and central parts of the country. They are not a threatened species but have stable numbers in the wild and are only threatened where there is a high concentration of cats in that area. The areas that they come from range from arid to semi-arid with a vegetation that varies between open woodland to rocky outcrops and vegetation. They spend the hottest parts of the day in relative cool places such as in burrows or underneath rocks and boulders. What are the characteristics of Bearded dragons? However, one of the things they are renown for is ‘basking’ which is when they lie on rocks, branches, fence posts or other surfaces so that they raise their body temperature to prepare for foraging for food. They can also go into a state which is known as ‘brumation’. This is often during times of adverse temperatures when they will go into a dormant state for long periods. They will spend this time in isolation in burrows underground or under rocks. They get their name from their distinctive throat, that can be flared out to make them appear bigger, when they are threatened. They can also appear threatening to males when they are displaying to females who are sexually mature. Their beard color will at the same time, turn black and then flatten their body to make themselves look wider and then leave their mouth’s open to enhance the effect. They will only put on these kind of displays when there are more than one bearded dragon in an enclosure or out in the wild. There is no need for them to do this when they live on their own, so you may not see it. What do Bearded dragons look like? In terms of their shape, they have broad, triangular-shaped heads with a flat body which is covered in scales and a short tail. They are typically colored a brown-red coloration with a pattern on the head and body a yellow gold. The underside of their body is a paler color. Breeders of bearded dragons are known for taking advantage of color of individuals, between different regional populations, mutations, so they can breed more selectively for different coloration’s. These mutation are known as color morphs which are what most domestic bearded dragons are. They eat a number of animal and plant material when they are in the wild which makes them omnivores. They do not eat tough material such as branches and wont touch grasses but will consume mainly green leafy plant material, fruits and flowers. They will also consume most types of insects and smaller mamals where given the opportunity. You can check out our Bearded Dragon foods page: Here we look at every single food that you may attempt to feed a Bearded dragon and whether it is good for them or not. What species of Bearded dragons exist? Bearded dragons are agamid lizards and are found in the Agamidae family and in the genus Pogona. Most domestic bearded dragons are known as Inland bearded dragons. Inland bearded dragons are scientifically known as Pogona Vitticeps and are the most popular type in size of population and most domestic bearded dragons will be Inland Bearded dragons, although others are kept as pets but in lesser numbers. Because Australia has very strict conservation laws, it means that the export of reptiles is prohibited and all types of bearded dragons outside Australia will be bred in captivity. Pogona Minor: the Dwarf Bearded dragon. Found in Western Australia, Northern Territorial and Southern Australia. They are a moderately small species measuring 16 centimeters in body length and 40 centimeters including tail. They are named after Latin ‘minor’ for small or smaller. Thanks for checking out Online Bearded Dragon Care, we hope you enjoy the site here.